MEA member Chad Downs almost left the field of education before he started. During his pre-student teaching at Eastern Michigan University, Downs said he couldn’t find a school or program that fit with his beliefs about education and creativity. Then an EMU advisor intervened and introduced him to Ann Arbor Open School, and the rest is history. 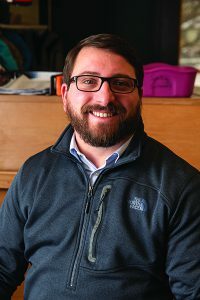 “I fell in love with this place,” he said of the K-8 magnet school where he’s taught in a 3-4 multi-age classroom for 15 years (or 17 years if you count pre-student teaching, student teaching and long-term subbing). Now Downs has been selected as one of 40 national winners of the 2018-19 Milken Educator Award, considered “the Oscars of teaching,” bestowed on early- to mid-career educators for their accomplishments and promise. The 39-year-old father of two was awarded the prize at a surprise assembly in December attended by interim Michigan State Supt. Sheila Alles and representatives from the Milken Family Foundation. Asked about why he won, Downs spoke as much about Ann Arbor Open School (AAOS) – its progressive student-driven, child-centered philosophy and the social-emotional learning integrated into every day – as he did about himself. Admitted by lottery, students at the school are encouraged to embrace their interests and follow their curiosity. Social-emotional learning is woven into the culture. AAOS has been around for decades and has an in-district waiting list of parents who want it for their children. For example, a lesson on stones and minerals once turned into an art project after a student’s eyes lit up at the realization tiles in her home were made of stone. The next day, Downs brought in extra tiles from a remodeling project, broke them into pieces, and the students designed mosaic art. “Those students learned something in a very real way and were able to take it home and have conversations with parents out of excitement,” he said. Like any public school, the Michigan Merit Curriculum is followed at AAOS, but learning is individualized. Not all children are working on the same assignments at the same time, and students have freedom to pursue projects and research that interest them. Student strengths are valued, he said. When his third or fourth graders reach mastery of sixth-grade vocabulary words, they join “Goof Troop” – a purposely silly name for peer helpers who work with others on spelling while completing advanced research projects of their own. Students work on improving weaknesses also, “but it’s always about connecting it to their confidence,” he added. Downs has played several leadership roles at the school, including co-curricular director and athletic director. He works on a committee that plans an annual professional development conference, an overnight event held offsite every March for the past 37 years. The conference by educators for educators offers presentations by experts on topics of interest and provides opportunity for conversation about struggles and successes. Last year’s topic – youth suicide – led to the AAOS counselor position being bumped up to full-time from part-time. In addition, from that conference the school is launching a new student program in partnership with the University of Michigan Depression Center – Peer to Peer Leaders – which will train a group of students to recognize students in need of extra help for anxiety or depression. The Milken Educator Award comes with a $25,000 unrestricted cash prize and the opportunity to connect with a network of other education leaders. The Milken Family Foundation encourages winners to exercise their voices in the public arena. Interestingly, Downs noted that a Milken winner from last year – Neal Cronkite – grew up in a tiny town, Otsego, right next to the tiny town where he grew up, Plainwell, and their two high school alma maters are rivals. The two teachers hope to do something to give back to the small region of Kalamazoo County that produced two nationally recognized educators in back-to-back years. In addition, Downs said he looks forward to meeting his assigned Milken mentor – a previous winner who will help him learn how to use his new platform, most likely to advocate for the open school concept he loves so much and believes in so deeply. This article does not do Chad justice. He is beyond amazing, and my children have flourished with and in his class.